The best teacher I ever had was a man named Bruce MacLean. I still remember his high school lectures on history, his hilarious stories about partying in Europe, the controversy about him hanging a Soviet flag in his classroom near the tail end of the Cold War. Bruce had long hair, acted like a wild hipster, buried us in homework — and actually prepared us for college. 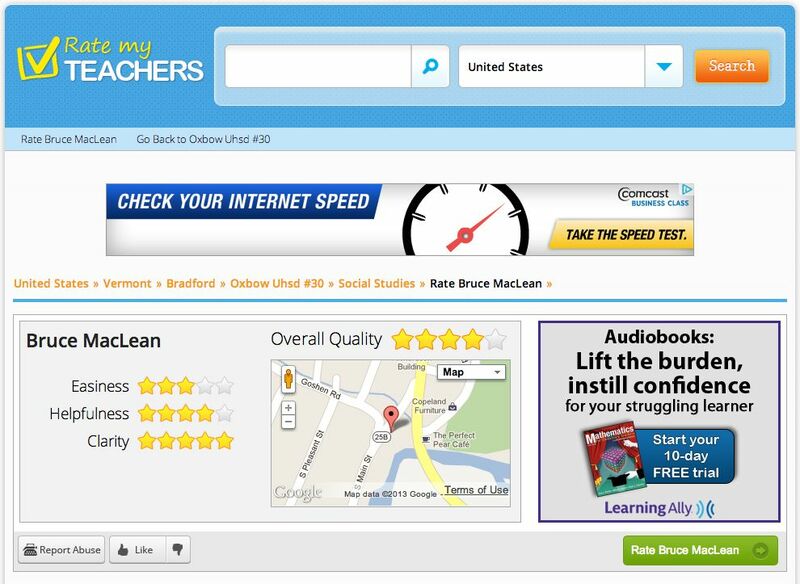 I bring Bruce up because I used him to test RateMyTeachers.com, a crowdsourced site in which today’s students rank their teachers. My son had pointed it out when complaining about a tough educator, and we checked out comment after comment that backed up his point of view. 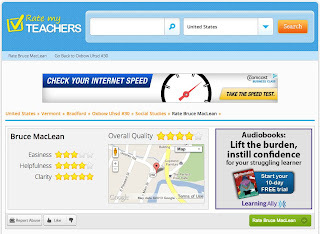 It’s the Yelp of education. So I punched in Bruce MacLean and sure enough, the score was on point. 5 stars for clarity, hinting at his smoking intelligence and tales. 4 stars for helpfulness, indicating huge amounts of homework. And 3 stars for fairness — he’s still a tough cookie on grades. A year ago, I ran into Bruce at a bar while visiting my hometown in Vermont. He’s on the verge of retirement and plans to travel the world with his wife. His hair is shorter and salty, and he still mesmerizes, cutting through debate with a sharp laugh. Clear, mostly helpful, and more tough than fair. It’s amazing that even when kids collectively gather wisdom, the grades are spot on.